Editor’s note: The announcement about Trendlines IPO received significant attention in the media. Selected articles appeared in Straits Times, Next Insight, Business Times, Deal Street Asia, Channel News Asia,May Bank Kim Eng (video interview), Globes, and The Marker (Hebrew). 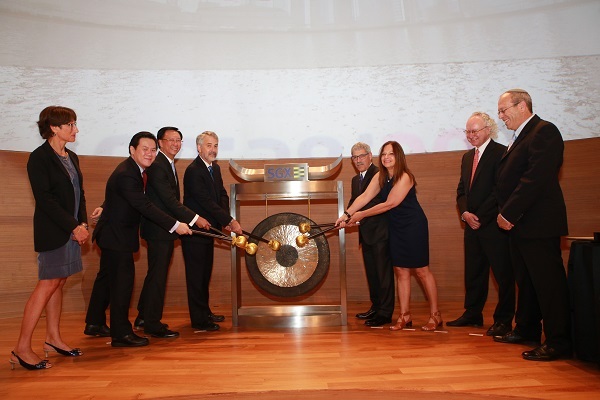 Sounding the gong for the opening of trading (l to r): Trendlines’ CFO Gabi Heller, Singapore Exchange EVP Chew Sutat, PrimePartners Corporate Finance Gerald Ong, Trendlines’ Chairmen & CEOs Steve Rhodes and D.Todd Dollinger, Ambassador of Israel to Singapore Yael Rubinstein, Trendlines’ Director Steve Haslett, Trendlines’ COO Yossi Ron. 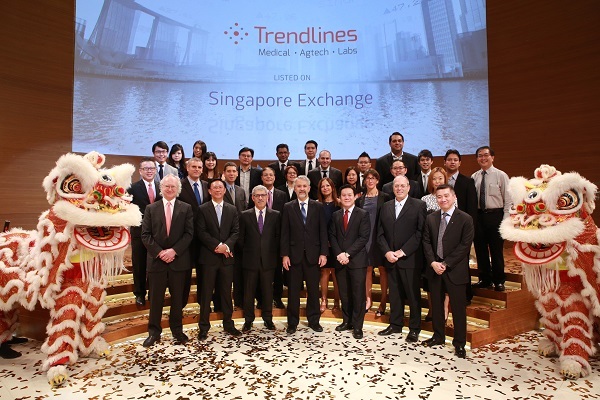 The Trendlines Group announced on November 26, 2015, that further to the launch of its initial public offering (“IPO”) on the Catalist of the Singapore Exchange Securities Trading Limited (“SGX-ST”) on 16 November 2015, the placement of the IPO shares has been successfully completed. The Company is trading on ticker SGX:42T. Trendlines offered 75,760,000 placement shares at S$0.33 per share, which was approximately 1.4 times price-to-book of Trendlines’ net tangible assets value as at 30 June 2015. Trendlines received strong interest from investors during the road show, and indications of interests from investors significantly exceeded the number of shares offered. A total of S$25 million (US$17.7 million*) was raised, including S$7.1 million (US$5.0 million) from cornerstone investor B. BRAUN Melsungen AG (“B. 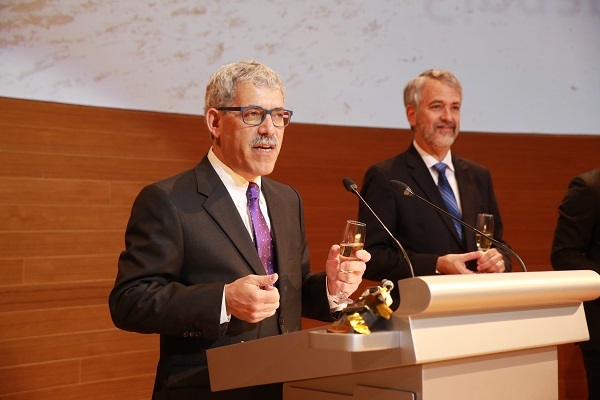 BRAUN”), a healthcare supplier with global sales of healthcare products of €5.43 billion. In the pre-IPO stage, Trendlines raised S$13.7 million (US$9.7 million) from investors, bringing total IPO-related proceeds to S$38.7 million (US$27.4 million). The trading of Trendlines’ shares on Catalist commenced at 9 a.m. on 26 November 2015. PrimePartners Corporate Finance Pte. Ltd. is the sponsor, issue manager and placement agent for the IPO. *All currency conversion in the press release is based on USD/SGD of 1.41 as of 20 November 2015. 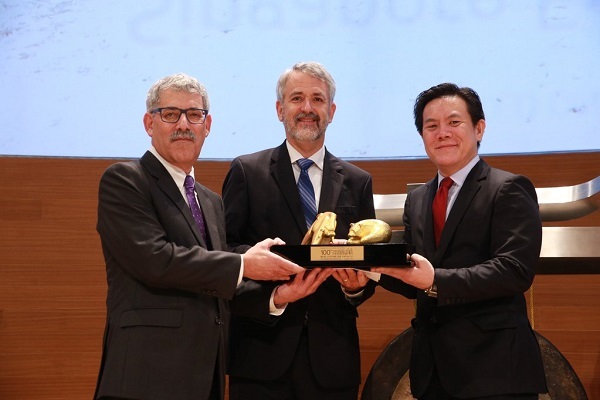 On behalf of the Singapore Exchange (SGX) Executive VP Chew Sutat (right) presents the traditional bull and bear to Trendlines Chairmen & CEOs Todd Dollinger (left) and Steve Rhodes (center). 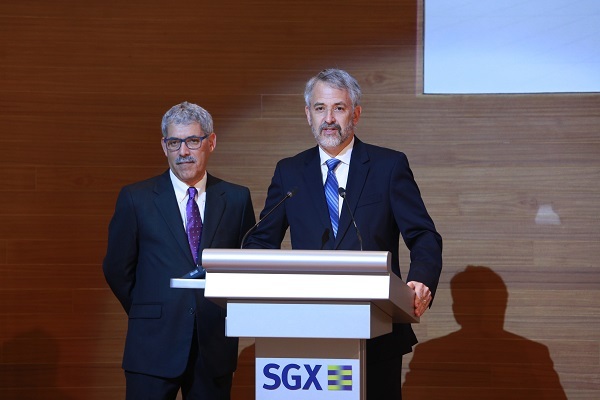 Trendlines Chairman and CEO Steve Rhodes addresses the audience at the SGX IPO ceremony. 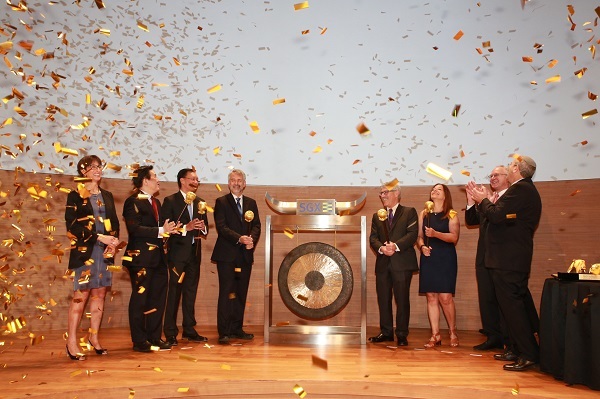 Members of the IPO teams sound the gong at the opening of trading. Confetti falls after the IPO gong ceremony. Trendlines Chairman & CEO Todd Dollinger makes closing remarks at the SGX IPO ceremony. The full IPO teams from Israel and Singapore pose with the dancing lions.